Jak Fuller has always wanted a home. An orphan born ten years after Azzadul’s disappearance, he has wandered far and wide, trying to forget the memory of a burning woman. When he comes to Fort Lasthall, on the outskirts of the Dark Lord’s former kingdom, he hopes to finally settle into a peaceful life. Instead, he finds himself unnaturally compelled by a dark, terrible voice, a voice that knows him, calls to him. A sense of destiny that fills him with fear. New powers are rising in the dark places of the world. A master of fire-rites called Talamus the Red, arch-foe of Azzadul, seeks to enslave the world with a magic he has been developing for the many centuries of his life. Ready at last, there is only one weakness in his plan, an obstacle he is determined to remove: a boy, bound to an old magic that just might resurrect the power of Azzadul. A Thousand Roads is now available as an ebook, and will be published as a print book in early 2019. 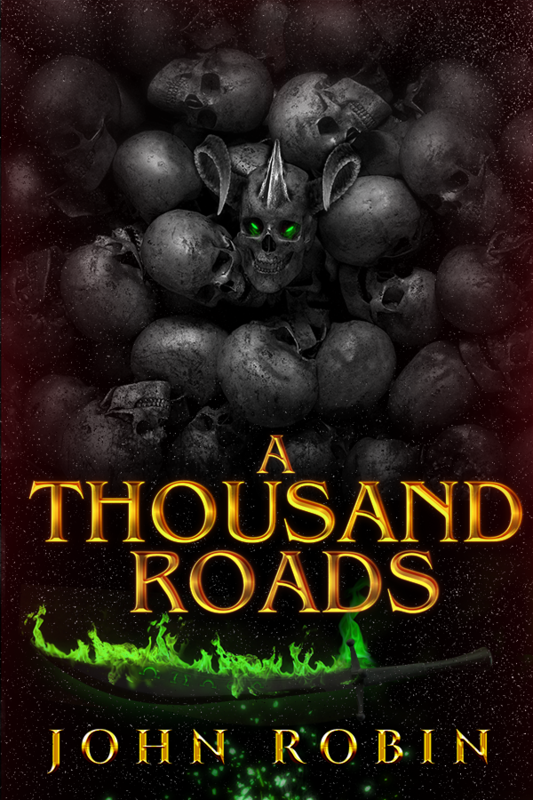 A Thousand Roads is the first book of many in what will be a grand fantasy epic told in the tradition of the epics like Lord of the Rings, or The Wheel of Time, except John’s horror influences create a fusion of various styles – what might be thought of as Harry Potter and the Goblet of Fire meets A Feast for Crows. If you enjoyed The Name of the Wind, and A Wizard of Earthsea, then A Thousand Roads will offer much the same with its epic narrative scope found through the close narration of one boy’s journey into a world of magic; if you enjoyed the Harry Pottter books but wished there was a book about Harry’s journey into adulthood – something darker where he grapples with the allure of dark magic and must decide just what kind of wizard he will become – then you will find something very much like that within the pages of A Thousand Roads. If you’re excited about A Thousand Roads and want to stay up-to-date on his progress, sign up for his newsletter. "A Thousand Roads is a truly impressive debut – a fully realized fantasy world teeming with magic, intrigue, and the undead."